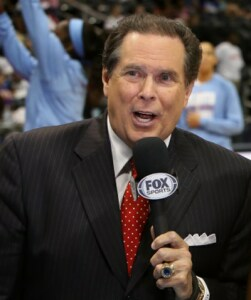 One of the NBA’s most recognizable and decorated play-by-play announcers, Bob Rathbun is the television play-by-play voice for the Atlanta Dream! Rathbun has earned a variety of significant broadcasting awards during his career. In 2012, he earned Georgia Sportscaster of the Year honors from the National Sportscasters and Sportswriters Association (NSSA). Rathbun has won nine Southeast Regional Emmy Awards, including one in 2009 for the broadcast of the Hawks-Celtics game six playoff contest from 2008. His basketball work has touched nearly all of the major broadcast outlets. His NBA work has earned him opportunities to call games for TNT and NBA-TV, after a collegiate resume that includes stints with CBS (NCAA basketball tournament), ABC, and ESPN (college basketball plus college football and the College World Series). With an extensive sports background, Rathbun’s broadcasting career has earned him eight Sportscaster of the Year honors (Virginia: 1980-82, 1985, 1988-89; Georgia 1998, 2012), a Distinguished Service Award from the ACC (1994), and a Distinguished Alumni Award from Catawba College (1988). He was inducted into his alma mater’s Sports Hall of Fame in 2006. Rathbun, who graduated with Bachelor of Arts degree in speech from Catawba College (1976), and his wife Marybeth have two children, Court and Grace. LaChina Robinson started her career with the Atlanta Dream, both on radio and television for Fox Sports South, while also serving as the color analyst on the Georgia Tech women’s basketball radio broadcasts. In her short career she has become on of the most respected and admired voices in College Women’s Basketball. LaChina is the TV analyst for the Dream, in which she has served every year since the teams inception in 2008. Robinson began working for ESPN in 2009 as a college basketball analyst and reporter, most recently on ESPNU and BIG EAST syndicated Game of the Week telecasts. In addition, Robinson works WNBA games and the WNBA Draft. During the 2012-13 season, Robinson was an analyst on ESPN2’s women’s basketball Sunday telecasts, made her fourth consecutive appearance as a game analyst during ESPN’s coverage of the NCAA Women’s Basketball Championship, and her first as a reporter in the regional round. She has also been a sideline reporter on select college football telecasts. 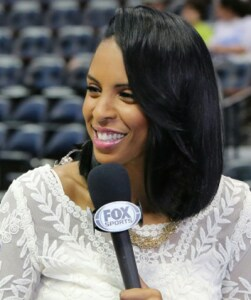 Robinson appears on NBA TV as a studio analyst for its WNBA coverage and as a social media correspondent during the NBA Playoffs. She also works as a game and studio analyst for the Big Ten Network and for the last two years was a reporter at the Women’s Final Four for NCAA.com. Robinson was a four-year starter on the Wake Forest University women’s basketball team, and a member of the 1999 ACC All-Freshman Team. Born in Boston and a childhood native of Alexandria, Va., Robinson graduated from Wake Forest in 2002 with a bachelors degree in sociology. Over a seven-year span (2003-10), Robinson held several positions with the Georgia Tech women’s basketball program, including administrative assistant of recruiting, director of basketball operations and special assistant to the head coach. Over the years Robinson has been a part of several NCAA development and leadership forums, including: the NCAA Leadership Institute for Ethnic Minority Females, from which she graduated in 2007; several NCAA Regional Leadership Conferences; NCAA National Student-Athlete Development Conference; and presided over the WBCA (Women’s Basketball Coaches Association) and NCAA ‘So You Want to be a Coach’ program until 2011. She also started a consulting company, Stretch Beyond, in which she implements student-athlete development curriculum, team-building activities and people-building strategies for collegiate sports programs. An avid public speaker at conferences and symposiums, Robinson was the recipient of the 2009 Atlanta Dream Women of Inspiration Award and named the H.A.U.T.E Power Woman of the Month in June 2011. She has volunteered in community programs such as Go Girl Go with the Women’s Sports Foundation, where she served in various capacities including their Grant Allocations Committee.